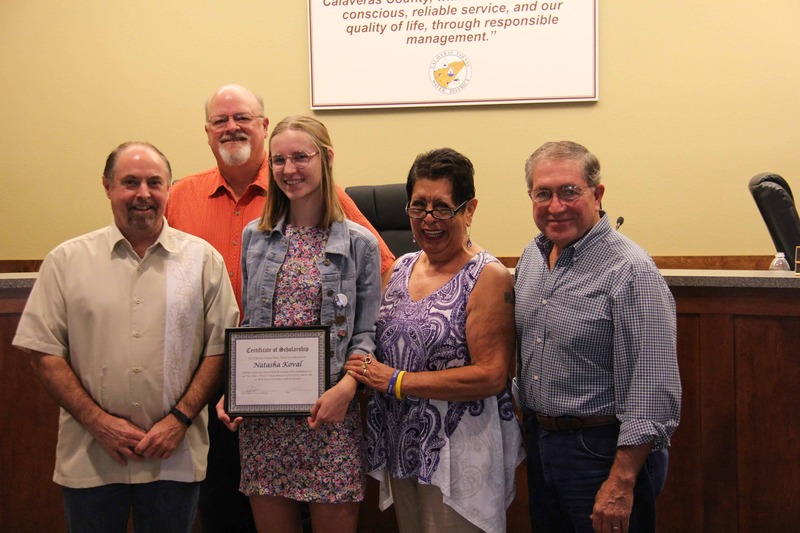 The Calaveras County Water District Board of Directors presented two $500 scholarships at its Board meeting on July 26, 2017. The 2017 scholarship recipients are Natasha Koval and Thomas Boitano, both of Calaveras High School. They were selected from about 30 high school seniors who submitted essays to CCWD. Ms. Koval, of Burson, began classes at Seattle Pacific University on September 25 in pursuit of a business degree. 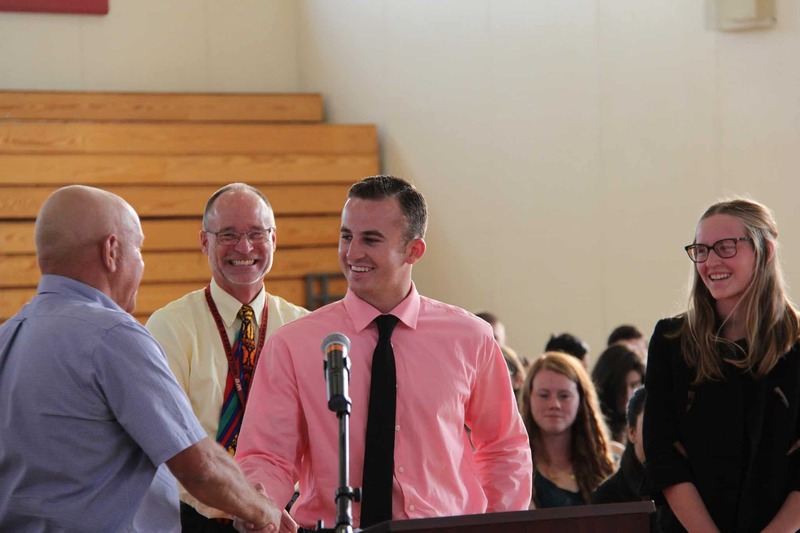 Mr. Boitano, of Mokelumne Hill, began his studies at Chico State on August 21 in pursuit of a degree in environmental science. Scholarship funds were made available to the students once they submitted proof of college class enrollment to CCWD. CCWD Board President Jeff Davidson shakes Thomas Boitano’s hand, who is one of CCWD’s 2017 scholarship recipients, while the second winner of a CCWD scholarship, Natasha Koval, looks on. Discuss the value of water, especially in light of the recent severe drought. How can Calaveras County transition from emergency water rationing during the drought to sustainable long-term water use efficiency? What measures should Calaveras and California take now in order to mitigate the negative impacts of future droughts? A committee of three CCWD staff members reviewed more than 30 essays that were submitted by students attending Calaveras High School, Bret Harte High School and Mountain Oaks School. All personal identifying information was removed from each essay submission, so committee members could judge them impartially. Each committee member chose their top three essays, and the group conferred to select the two winners for the 2017 awards. Scholarship funds will be made available to the students once they have submitted proof of college class enrollment to CCWD. The District wishes Mr. Boitano and Ms. Koval success in their academic pursuits. The CCWD Board of Directors presents Natasha Koval with her $500 scholarship on July 26. From left, Director Scott Ratterman, Director Terry Strange, Natasha Koval, Director Bertha Underhill and Director Russ Thomas. Board President Jeff Davidson was unable to make the meeting.